But all of these are true! That doesn’t make this a bad film. It is a fantasy. If you take it as a fantasy grounded in what the Bible and other sources supply, then you can enjoy the movie. If you can’t have an open mind and allow the filmmakers and actors to have some artistic license, then this film isn’t for you. So here is my review. Spoilers ahead! I saw “Noah” in the cheapskate matinee theater for $2.00. The picture was clear and clean. The sound was good. But there were a ton of commercials and previews before the movie. TOOO MANNNYYYYY!!!!!! When the movie finally began, we get a short scene from Noah’s childhood, and we get a brief creation story, which is repeated several times. I like the nature of this story…It would have been handed down generation after generation in this way orally. We see it repeated several times throughout the film in varying detail. Always God is referred to as “The Creator.” And he is revered and respected by most, in a way that shows paranoid fear….the way early Old Testament folks would have thought of him. Nothing at all like our loving Jesus. More like and angry, vengeful, unreasonable God. There is another starling addition…”The Watchers.” If you read your Bible, you find that it says “There were giants in the land.” More in depth study reveals “the Nephalim.” This film interprets them as fallen angels, cursed to be encased in rocks by God for trying to help Man on his way from the fall in the Garden of Eden. This becomes an important plot point later. It is with these Watchers that some of the most creative license is used. The way they are animated, they remind me of Michael Bay’s transformers. Noah clearly is presented as a prophet. 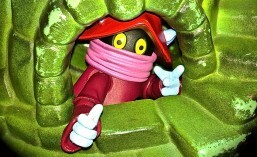 He has visions from God, but can’t explain or interpret them. Here is one of the things that rubbed me wrong…He goes to see his grandfather, Methuselah, (Bible scholars will know him as the oldest man recorded in the word.,) and the old guy drugs him with some tea…tea that lets him see clearly what God is trying to say. To me, this is a unacceptable insertion of a New Age idea….To me, Noah would have fasted and sanctified himself for days in order to understand God’s message. But I enjoyed this spin as artistic license, I suppose. Armed with the knowledge of how God is going to judge the world, he instructs his family to build the ark, and enlists the help of the Watchers. There is this nursery picture that most people will be familiar with. The ark on a hill. The animals walking two by two into the ark. Etc. NOT IN THIS MOVIE! The animals come as a miracle. a flock of all different birds come flying in. And Noah and his wife know how to make them sleep for days and days by mixing up some mystical new-age incense. Here is a spin I never saw coming. And then the snakes and bugs come, and then the mammals come. They all get pacified so that they are no trouble at all for Noah and his crew. A truly different spin on one of the big problems to solve in this story. After the animals arrive, the other humans of the world enter as a big problem. Tubal-Cain, the “king of the world,” threatens to take the Ark. The Watchers have Noah’s back, so that’s that. Noah has three sons…Shem, Ham, and Japeth. The film portrays Ham as the worst son. He wants to have a wife. Noah can’t find a wife for him. And when he sees how bad things are in the “cities,” now mobs of violent hungry people, he takes it that God wants all of men to die out, including him and his family. Long story short, right as it starts to rain, Ham is trying to find a woman, Noah causes him to leave her to be trampled by the horde of people moving on the Ark…Everyone except Noah and his family make it on the Ark…ut Tubal-Cain becomes a stowaway. He takes a new role as the devil for Ham, who wants revenge against his father. Tubal-Cain also does the forbidden, in killing the animals and eating them, (causing extinction.) Shem’s girlfriend (played by Emma “Hermione” Watson,) is pregnant, Noah thinks he has to kill the baby, (Turns out to be twin girls..wives for his two children who have no female companionship.) The climax of this drama, Tubal-Cain tries to kill Noah, manipulating Ham…right as the children are born and the rain stops. I never think about the character of Noah as a negative kind of guy. Certainly, he wasn’t perfect. But this film shows him as losing his sanity, he has it in his mind to kill those babies. And the mvid does everything in it’s power to build that tension to a head. When you think the knife is going into that babies head, you actually see it go down, but Noah kisses the child instead, and at the end bestows his blessing on the two children. 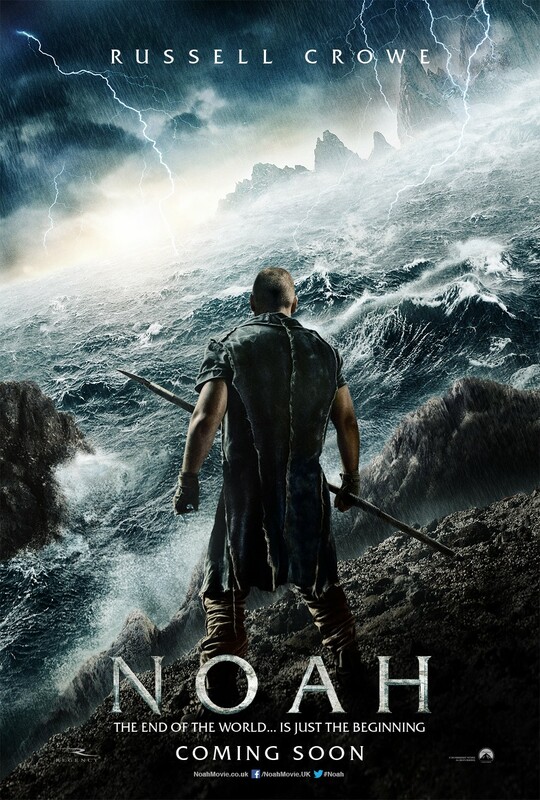 Rating this movie is hard….As Hollywood’s secular take on Noah’s story as a fantasy and drama, it has to get a 5/5. But taken as a Biblically sound movie, it gets a 2/5, the 2 points comes for great acting and special effects. I took my 8 year old SpartanSmurf #2…And I knew that I was going to have to do a lot of explaining about the truth and the artistic license in this film. Overall, I liked it like I like “Star Wars” and “Avatar.” Not like I like “The Bible” TV series, or “The Passion of the Christ.” What do you think, oh Hub City Geeks? Am I being fair and accurate? Let me know!